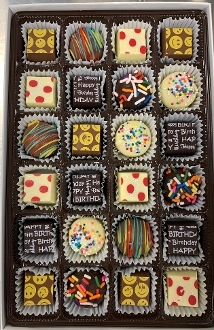 It's a party when you order this delicious and whimsical Happy Birthday Chocolate Assortment. A lovely combination of delicious filled molded chocolates and truffles with birthday embellishments. Flavors such as dark chocolate raspberry, vanilla chocolate chip, caramel, vanilla bean and dar chocolate. Perfect for any birthday!!! Also available in Dark Chocolate only. Double the chocolate (Double Decker) for only $25. Add our amazing 3 Happy Birthday bars for a terrific chocolate birthday gift! !